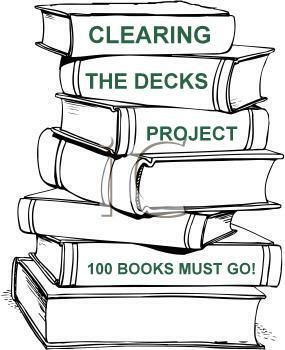 Little over a year ago I launched my Clearing the Decks Project. I pulled from the shelves one hundred books that I was confident I wouldn’t want to keep after reading to create my own home library. I would borrow books from the stacks and then return them to a charity shop, thus clearing the decks. The project worked – 40 books have gone and just 60 remain – better figures than I hoped. But I only read 9 of those books. 31 I decided I didn’t want to read. Once they were off the shelf I realised that I didn’t need to read them. Because other books would always be there calling me more loudly. Because my reason to read them have been lost since I bought them home. Those 31 books should not take offence. They are all I’m sure good books, but they aren’t the books for me any more. Almost every day I discover a new book I want to read, or I think of an old book I want to read again. And so I have learned that I have to be selective, to read only the books that I am confident I love, the books that will offer me what I need. So now I only buy books that I can’t order from the library and books that I am quite certain I will want to keep. And I am going to keep clearing the decks. I’m sure that I have other books that I can read, write about, and then pass on. And others that I can simply let go. So watch out for 40 more joining the project! I am trying to do something similar with the TBR challenge (especially with not adding new books to the piles). Did you read anything from the 31 (a chapter or a page), or could you just tell that you weren’t going to read them? It was about half and half. Some books I started reading and then decied that they weren’t for me, other I realised I no longer appealed before I started. This is great idea Fleur but my problem is I’m married to a man who never chucks anything out. I think he might notice 40 missing books. I’ve reached the point where I have to. We are running out of space, and my tastes have changed with my lifestyle since I moved from London back to Cornwall. That’s wonderful – please do! Until last year I never gave any of my books away (unless they were truly awful) but since then I have given hundreds to charity shops. In fact I have 3 overflowing Asda for-life bags downstairs awaiting the very same fate. I have SO many books in the house that I can’t accommodate them all. The only ones that go are ones that I have no intention of reading again, ones I didn’t like or review copies that I have no intention of reading (I get so many). My plan for this year is to read books that I mainly have already as I have so many on my shelves that have been calling my name for years. I hold on to more than I give away, but so many new books are calling and their are many books I want to read again that it’s not so difficult to part with the others. Living in France i don’t have the option of a library so I have to buy and the Pheonix twice-yearly euro a book sale in aid of animal rescue has meant that the bookshelves are overflowing. Each time I go to the sale I take bags of books and come back with nearly as many… And then there’s awesome books with their 4 for 3’s, and people lending me books and the books to read for two book clubs and that’s without trawling through book blogs and finding even more books. It’s no wonder that the bookcase in my bedroom collapsed yesterday. I managed to select 9 for the charity pile, another fifteen to distribute around the famil) and put back 120 on the shelves . that was a good and productive project for you (and others who got some great books). I’m doing something similar this year. I’m reading books I’ve stock piled on my kindle and cleaning off samples–just because I don’t want to read them anymore. I have been such a hoarder where books and magazines are concerned. I found a Woman’s Weekly from 1989. I probably kept it because it’s not available here. I do have a few empty spaces now and will keep removing books as I read them. Sounds like you have made great progress. What an admirable effort. I always fail at these things. Even books I felt only “meh” about I find hard to get rid of. I really should start following your example. It may even provide some money to buy a *new* book. I need to think about doing something like this myself. I hate getting rid of books, but it does seem silly to be keeping books on my shelves that I know I’m never going to read again. I’m impressed that you’ve managed to let go of so many! I really should gently evict many of the books I have and know I won’t ever read. I seem to end up reading more books from the library than from the tbr stacks anyway so I think your plan sounds very sensible. Maybe those evicted volumes will find someone who really needs or loves them!